Make meal and snack time simple with Kaplan's vast collection of meal essentials such as cloth bibs, scoop bibs, utensils, plates and training cups. 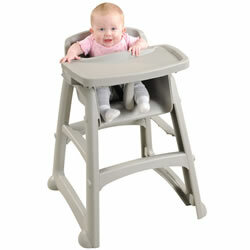 Optimize feeding times with items such as our bottle warmers, highchairs and kitchen supplies. Drinking made easy for children. Includes: six 4 oz. clear glasses, six 8 oz. clear glasses, and two 32 oz. 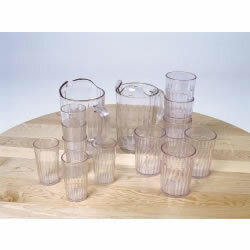 clear pitchers. 12 months & up. These easy-grip utensils help toddlers learn to feed themselves. 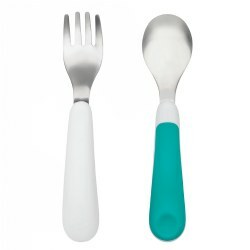 Both Fork and Spoon make it easy for young eaters to get their food from dish to mouth. 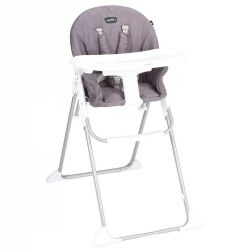 A flat spot on the handles prevents the fork and spoon from rolling off the table or high chair tray, and the soft grips are shaped to keep them from sliding into bowls or plates. 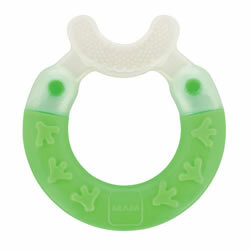 Made of durable stainless steel, silicone, and plastic. Spoon measures 5.4" x 1.2" x 0.6" and fork measures 5.4" x 0.9" x 0.6". 12 months & up. Full, waterproof protection from meal time to play time. 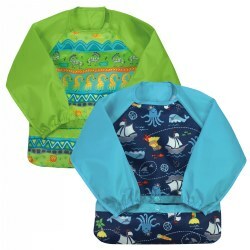 Made with soft, waterproof material that keeps baby comfortable and fully protected. The unique pocket flips from back to front to create an extended scoop® to keep food from dropping to the floor. 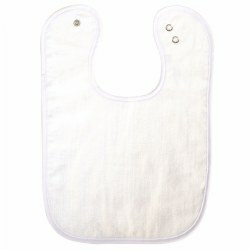 The bib is easy to clean and remove with the adjustable hook-and-loop closure. Elasticized sleeves for added protection. Set of 2. Styles may vary. 1 - 3 years. 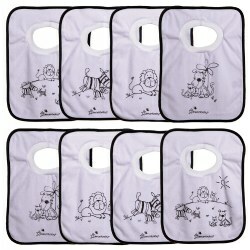 This durable terry velour bib is sized large to catch big spills. The pull-over opening is generously sized. Unlined and solid white for ease of cleanability. Machine wash. 11" x 18" each. 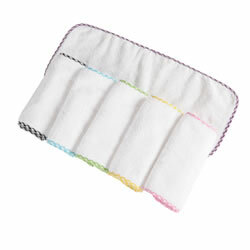 White washcloths with assorted colored trim are 100% cotton terry. Machine washable. Set of 18. 18 months & up. Help toddlers transition to a regular cup. Features a fish themed motif and wide base for stability. Top rack dishwasher safe. BPA Free. 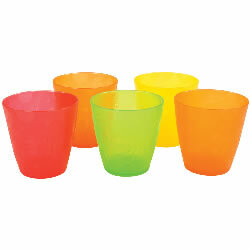 Ten cups in five vibriant colors, 8 ounces each. 3 months - 2 years. 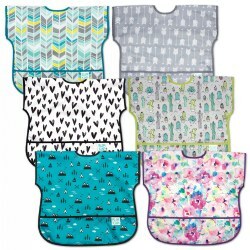 Set of six absorbent cotton terry bibs with adjustable snap closure. Machine washable and dryable. Each color is a set of 6 bibs. Choose between white, blue, and green. Bibs measure 15"L x 11"W.
3 months & up. 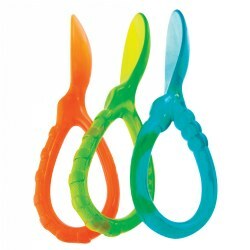 Rounded, soft spoon bowls and ergonomically-designed handle makes these spoons gentle on baby's gums and easy to hold. BPA Free. Top rack dishwasher safe. 9 months & up. The perfect bowl for first time eaters. Features include a suction cup base to keeps bowl securely in place and a flexible food catcher that funnels food back in the bowl. BPA Free, Phthalate Free, and PVC Free. Top rack dishwasher safe. Set of 2. 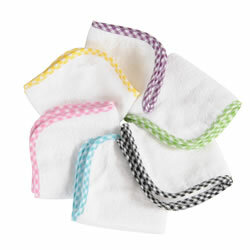 Keep babies and caregivers clean with this colorful assortment of burp pads. Machine washable. Set of 6. 3 - 12 months. The absorbent terry material and waterproof inner layer help absorb drips and drools and protect your baby's clothing. 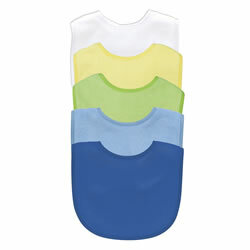 Bibs fasten securely in the back with a hook and loop closure and come in a variety of colors to wear with anything. 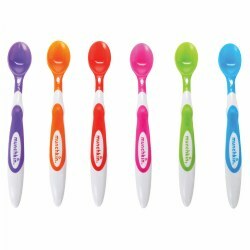 Set of 5 assorted colors. 9 months & up. These toddler utensils are ergonomically designed with no sharp edges and have a soft, comfort-grip handle for independent feeding success. 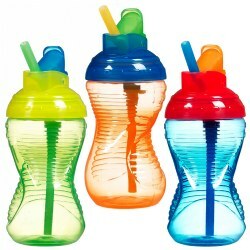 BPA Free, Phthalate Free, and PVC Free. Dishwasher safe. Colors may vary. 6 months & up. 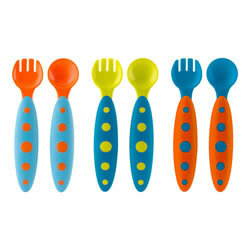 Spoons with rounded handles allow for a variety of gripping options to accommodate all developmental levels. The Reflo Smart Cup™ is an alternative to sippy cups and a transitional tool for children to learn to drink from an open cup. Insert controls the flow of beverage anywhere along the cup's rim. BPA-free, phthalate-free, dishwasher safe, and no moving parts to trap dirt and germs. Holds up to 6 ounces of pulp-free beverage. Set of four: clear, green, blue, and pink. 6 - 24 months. Durable, lightweight, PVC-free fabric is easy to wipe, machine washable, and waterproof. Features a large, back shoulder Velcro® closure for a quick, adjustable, and tug-proof fit with a generously sized flip-pocket designed to catch messes. Patterns may vary. Available as a complete set of 6 or in sets of 3. Patterns may vary. For a child up to 50 lbs. Compact and self-standing when folded. 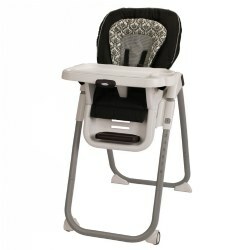 Features 5-point harness, 3 position adjustable and removable tray. 2 position adjustable backrest with footrest. 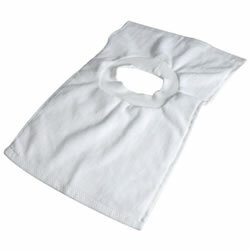 Removable and washable seat pad. 12 months & up. Set of three 10 oz. 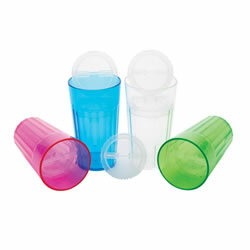 capacity leak-free toddler cups with soft, silicone straws. Ridged, contoured design for small hands to hold with ease. BPA-free and top rack dishwasher safe. Colors will vary. Birth & up. 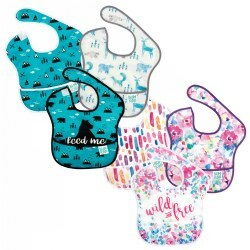 These Terry cloth pull-over bibs are easy to use and clean. One size fits most. For use with children up to 3 years of age, not exceeding 40 lbs. 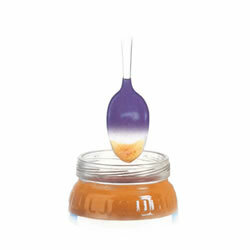 Attractive styling, easy to clean, and designed for institutional feeding. Tray can be easily removed with one hand. Meets all ASTM safety standards and can be stacked, without tray, to minimize storage space. 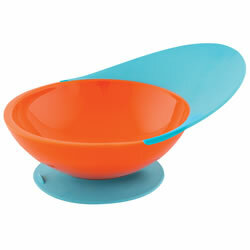 Use without tray against a table for feeding older children. Includes feeding tray. 23 1/2"L x 23 1/2"W x 29 3/4"H.
3 months & up. White Hot® safety tip turns white when food is too hot and the soft tips are gentle on baby's gums. Top rack dishwasher safe. BPA Free. Set of 4.